Another golden night for Michael Phelps; Outrage over Trump Second Amendment comments. (Image via Michael Phelps' Facebook page). Olympic update: Security was stepped up on Tuesday after a bus carrying members of the media was shot. 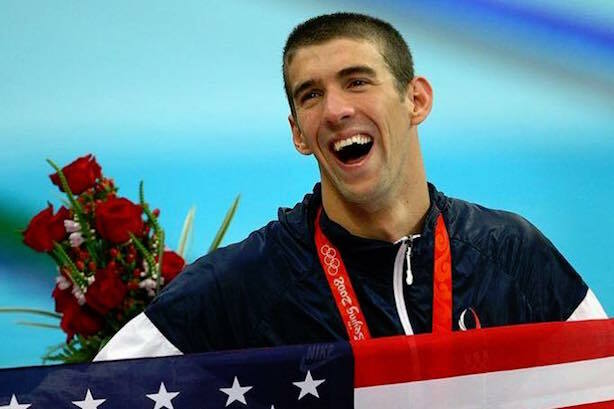 Michael Phelps won his 20th and 21st gold medals. Swimmer Katie Ledecky brought home another gold medal. The U.S. women’s gymnastics squad took gold. Serena Williams was upset. An NBC announcer called the spouse of a Brazilian volleyball player by the wrong gender. The Olympic diving pool turned green. Twitter users responded after a Mexican gymnast was body-shamed. Another day, another Trump comment controversy. This time, the outrage is over the Republican candidate’s comments that gun rights supporters could prevent a President Hillary Clinton from appointing Supreme Court justices critical of the right to bear arms. Spokeswoman Katrina Pierson fumbled her explanation of the comments, which Trump claimed are just being spun by the media. The U.S. Secret Service indicated it is taking the remarks seriously. MSNBC’s Joe Scarborough wrote in The Washington Post that it’s time for the Republicans to figure out how to dump their candidate. More Clinton emails leaked. More than three-dozen newly released emails from Hillary Clinton’s time as secretary of state have raised more questions about whether the Clinton Foundation tried to exert influence over the State Department. Clinton has denied any conflict of interest between the two organizations. The Democratic nominee also disavowed the support of the father of Orlando nightclub shooter Omar Mateen, who appeared behind her at a rally on Monday. Delta hopes to get back to normal this afternoon. The airline is set to cancel about 90 flights on Wednesday due to residual effects from Monday’s outage, but it could get back on schedule as of early afternoon. Delta has cancelled more than 1,770 flights in the past two days. Consumer groups want KFC to crack down on antibiotics. A coalition of consumer groups are planning to send KFC a petition on Wednesday demanding it cut back on the routine use of antibiotics in its poultry. More than 350,000 people have signed the petition. Burson works on Texas voter-education push. The WPP agency is working on a campaign with subcontractor TKO Advertising to educate state voters about ID laws ahead of November’s election. Advocates have been critical of the state’s past efforts to reach minority voters, and a federal appeals court ruled last month that Texas’ voter ID measures discriminate against minorities.